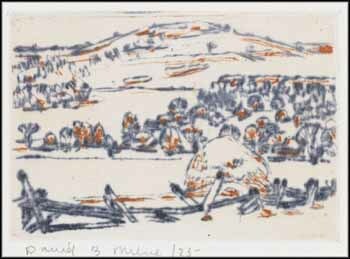 Concurrent with his paintings and watercolours, David Milne produced a superb body of work executed in drypoint etching. Rosemarie Tovell writes: "The most important of Milne's prints are, without doubt, his multiple-plate colour drypoints. Simply stated, they are unique. No other artist in Canada or abroad has attempted this technique." Milne was familiar with etching from his time in New York, and the quality of the line achieved in drypoint, scratched into copper or zinc plates with a needle, produced soft, uneven lines, similar to his style in his paintings and drybrush watercolours. Among Milne's colour drypoints, no two are identical - varying due to changes in colour as he produced different impressions, and due to his techniques of hand-inking and wiping the plates. Regarding Haystack, Tovell notes, "Although the edition is marked on some of the signed prints as twenty-five, only seven impressions, of which five are signed, are accounted for. This does not include the possibility of a Clarke order for one or two impressions in 1930." Thus this signed print is rare, and has not been offered at auction before.